If you’re a new owner of a rabbit, you may be wondering how to properly take care of your new pet. Rabbits are not low-maintenance animals, and they require a similar amount of time, money, and care as cats and dogs. They are going to need a water bowl, high-quality rabbit food, toys, as much exercise as a dog, and a litter tray. Rabbits are animals with their own personalities, so you may have to personalize some of your care to match your rabbit’s personality. Rabbits are animals that are going to need your daily love and attention. Due to the amount of care that rabbits need, you’re not going to be able to leave them on their own for very long. If you have to go out of town, you should strongly consider hiring a pet sitter for your pet rabbit care needs. If you don’t know a lot about rabbits, you might not realize that they need company and companionship from you – much like a dog would. If your rabbit is your only pet, you need to devote time every day to spend with them because rabbits that are alone too much can become very lonely and depressed. A good goal to aim for is to spend at least three hours a day with your rabbit. This time can be spent playing with them by giving them cardboard tubes, phone books, and rolling toys, all of which rabbits love. If you’re concerned about not being able to spend enough time with your rabbit every day, consider getting another rabbit. However, it’s very important in terms of pet rabbit care that the rabbits be housed separately until you have properly introduced them to each other and they have been allowed to form a bond. Rabbits do not like to share their space unless they have been specially bonded to the other rabbit. While rabbits look adorable and cuddly, they actually don’t enjoy being cuddled or hugged too much. Rabbits can actually be very afraid of being hugged because it can sometimes replicate being hunted by hawks and other birds. To promote good pet rabbit care, you should be very careful to avoid leaning over them and trying to pick them up to avoid triggering this natural fear. This doesn’t mean you can’t stroke your rabbit, they just prefer it for shorter periods of time rather than longer periods. This is an aspect of having a rabbit that is going to depend heavily on the personality of your rabbit. 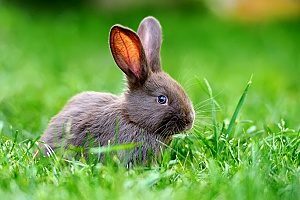 It is very important to know how to pick up a rabbit properly as they are easily frightened animals and they will struggle when they feel they are in a frightening situation. This is extremely serious as rabbits can sometimes struggle so much that they break their own back in the process. Obviously, you want to avoid this happening to your new rabbit. To pick up a rabbit properly, scoop the rabbit up using one arm along the side of your body with the opposite hand under the rear end. As you lift your rabbit up, bring the rabbit into the side of your body to provide further support. 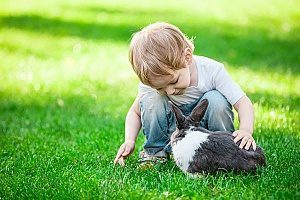 If you have children in your home, it’s very important that you teach them pet rabbit care as well as how to interact with your rabbit properly. Rabbits can feel like they are being attacked by a predator if a child is yelling and screaming around them. Rabbits can also feel very threatened and could potentially lash out if they are chased. As your rabbit seems to get used to you, you can start to let them out of their cage. You should close all doors is possible and block and exits that your rabbit may be able to go through. When you open the cage door it is very important not to lift your rabbit, but rather allow them to come to your on their own time. Sit in the middle of the room and do something quietly and give your rabbit as much time as they need. Don’t encourage them to come over to you, just allow them to explore the area and get comfortable. Just be sure not to move to quickly or you may scare them. If they approach you, you may try petting them at this point. If your rabbit lowers their head to the ground, you can continue. However, if your rabbit flinches or runs away, stop and wait for them to approach you again to give it another try. Buy a large cage for your rabbit or even a dog pen. You just need a space where your rabbit can feel comfortable and safe. As mentioned before, rabbits are individuals and because of that, they are going to prefer different types of bedding. You may have to do some experimenting to discover which one is your rabbit’s favorite. Bedding materials can include shredded paper, straw, and hay. Avoid wood shavings as these can be inhaled by accident. Your rabbit is also going to need a litter box. You will also probably find that your rabbit has preferences when it comes to litter boxes. It’s a good idea to start off with a cat litter box that is big enough for your rabbit to lie in comfortably. From there you may discover that your rabbit prefers a box with a cover, or they might prefer a certain height for their little box. You should also experiment with different kinds of litter to see if they prefer cat litter, shredded paper, wood shavings (that aren’t pine or cedar), straw, or hay. You need to make sure that whatever you use does not clump and isn’t made of clay, as these things could harm your rabbit if they swallow them. The ideal food for your rabbit is going to be grass or hay. However, they do also like broccoli, bok choy, carrot tops, beet tops, cilantro, collards, Brussel sprouts, kale, cabbage, and other greens, but these should not be the main source of their diet. The more you get to know your rabbit, the more you’re going to realize the special pet rabbit care and attention they need. This means that when you have to go out of town, you shouldn’t leave your pet rabbit care to just anyone and should hire a professional pet sitting service.